The other night I was trying to decide what to make for dinner and thought about making up some Sausage and Pepper’s. Then I thought about having some pizza instead. That was when I realized I would just combine the two. In the past when I’ve used pizza crust, I’ve told you that I purchase the dough either from the store or one of our local pizza places. I’m not one of those people who has the talent for bread and dough making. And, I do believe it’s a talent that some people just seem to have. Finally, I decided to try my hand at my own pizza dough, and after making batch after batch of it, I won’t ever be buying a store bought dough again. Well, actually, that isn’t true. If it’s on sale or if I’m in a rush I would still buy the store made version. But, I will admit that working with freshly prepared pizza dough was a wonderful experience. Here is how I made just one of my most favorite pizza versions. Place water in a small bowl and stir in the yeast. Let stand 5 minutes. **NOTE: If you find yourself making the dough on a cold day and don’t have a warm spot to place it, this is what I have done and it’s worked well. I turn the oven to 200 degrees until just heated. Turn off the oven and wait about 15 minutes. Then I place the bowl with the dough, which I cover with a clean dish cloth, in the oven and allow to rise. It will usually rise this way in less than an hour. In a large sauté pan, break up the sausage and brown completely. This will take about 15 or more minutes. You want to make sure the sausage is fully cooked and evenly browned. Once the sausage is done, remove it to a plate lined with paper towels to absorb any excess oil. In the same pan that you just browned the sausage in, add the sliced onions and peppers. Depending on how lean your sausage is, you may have enough excess grease left in the pan to cook up the onions and peppers. If you don’t, add 1 or 2 teaspoons of olive oil and sauté the peppers and onions until just soft. Take your risen dough and form it into whatever shape you prefer. I did this in a 16″ pizza pan and it came out perfectly. Since the toppings are pre-cooked, I decided to pre-bake the crust for a few minutes before adding the toppings. Place the dough in the oven and allow to pre-bake for about 6 – 7 minutes. 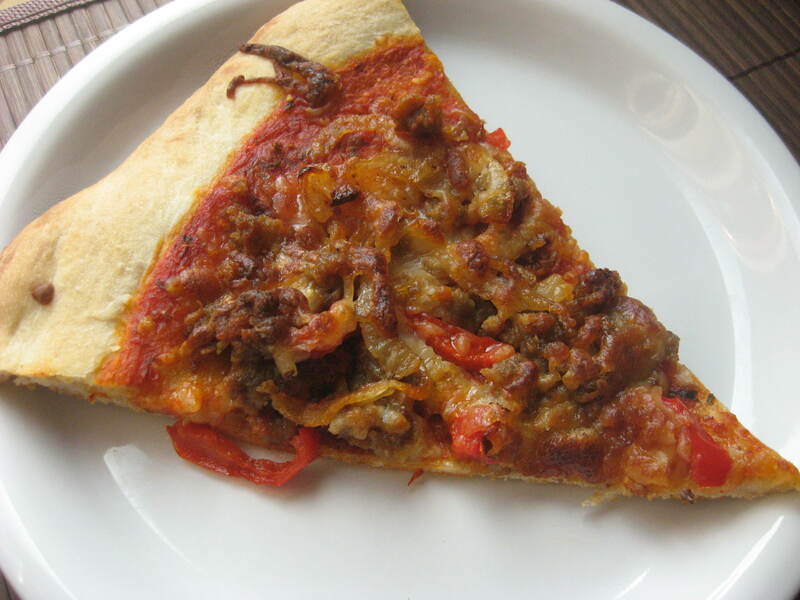 Remove from the oven and top the crust with the pizza sauce, sausage, peppers, onions and mozzarella cheese. Return the pizza to the oven and cook until the top is bubbly, the cheese melted, and the crust is a golden brown. Sometimes, if I feel like the bottom of the crust is not cooking to the crispness I like, I will slide the pizza off the pizza pan directly on the oven rack half way through the baking process and finish it that way. If you are using a pizza stone, you won’t need to do this. Once done, remove from the oven and allow to set for a few minutes. Slice into 8 equal pieces using a pizza cutter and serve. Enjoy! I’ve shared this recipe over at Kim’s blog (Previously known as “Quit Eating Out”) “Recipes to Run On”. Check out Kim’s site by clicking on the link below and view some other links to some great bloggers. I’m going to share something weird about myself with you today. There are many weird things about myself, so this is really just one of them. I hate clams. Don’t even eat an oyster in front of me. Blech! But, I LOVE mussels, and this is my most favorite way to eat them. Simmered in some butter, wine and garlic isn’t bad either, but in a spicy tomato sauce will always be my first choice. We made a large bowl of these and sat out on the deck just picking them clean. Delish! Begin the tomato sauce in a large skillet. Add the oil, onion and garlic and sauté until just before the garlic begins to brown. Add the wine and mix well, scraping up the bottom of the pan. Add the crushed tomatoes, red pepper flakes, oregano and salt to taste. Stir well, place on simmer and cover, stirring occasionally so you don’t burn the bottom of the sauce. Go through the bag of mussels and discard any mussels that have cracked and broken shells. If you have any mussels that are slightly open, don’t discard them right away by assuming they are dead. Tap the mussel several times. If it’s still alive it will close immediately. If it doesn’t close after a few taps, discard the mussel since it’s no longer alive. In a large bowl filled with cold water (I actually use 1/2 of my double-sided sink), cover the mussels with cold water and allow to soak for about 15 to 20 minutes. Drain the mussels and remove the beards. The beard is a tough stringy substance stuck on the outside of some of the mussels. Grasp the edge of the beard and pull down firmly towards the hinge of the mussel and remove. Scrub the outside of each mussel with a hard brush to remove any debris or barnacles on the outside of each shell. Place in a colander and give them a final rinse under cold water and set to the side for a few minutes. Add your fresh basil to the tomato sauce, stir well, and prepare to add your mussels. Add all the mussels to the tomato sauce, stir gently and cover immediately. Keep covered for 3 minutes. Remove the cover, give another gentle stir, cover and allow to cook for an extra 3 to 4 minutes. You don’t want to over cook these for any longer than a total of 7 minutes or the muscles will turn tough and chewy. Once done, remove any mussels that did not open and discard. 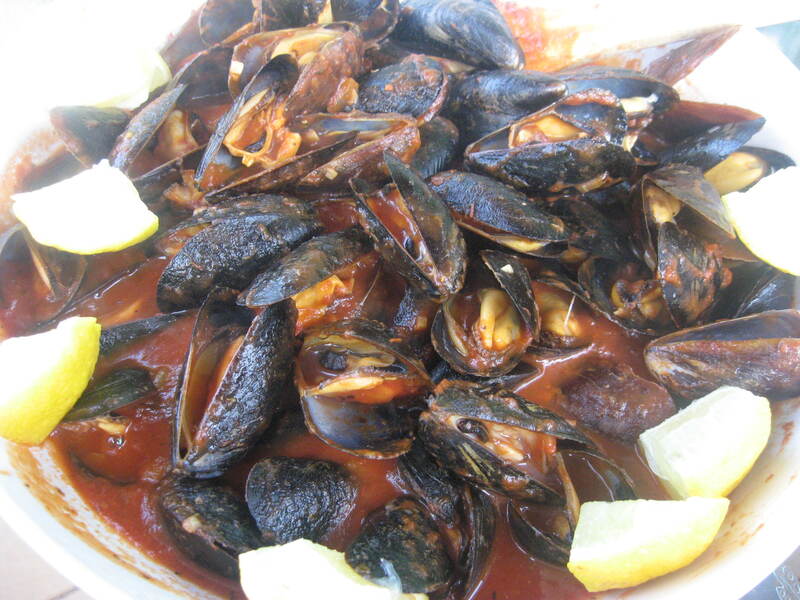 Take the remaining mussels and gently spoon them into a large dish and cover with sauce. Serve with some sliced lemon for squeezing, sit back and enjoy. Make sure to use that crusty Italian bread to soak up all that delicious sauce. You could always serve these over some cooked spaghetti, but I prefer them just the way they are. They had rump roast on sale last week and I picked one up undecided what I wanted to do with it. While I was searching through some recipes over at Tasty Kitchen, I came across one that had received all positive reviews and looked delicious, so I gave it a try. It’s different than the typical pot roast I make with potatoes, carrots and onion. I was looking for something different so this worked out perfectly. The tomato and garlic really does something different to this dish in a very good way. The meat was fork tender and the sauce was tangy and filled with garlic. I added some thyme and rosemary to the dish, which the original recipe did not call for, but it turned out wonderfully. Other than that, I kept the recipe the same way. 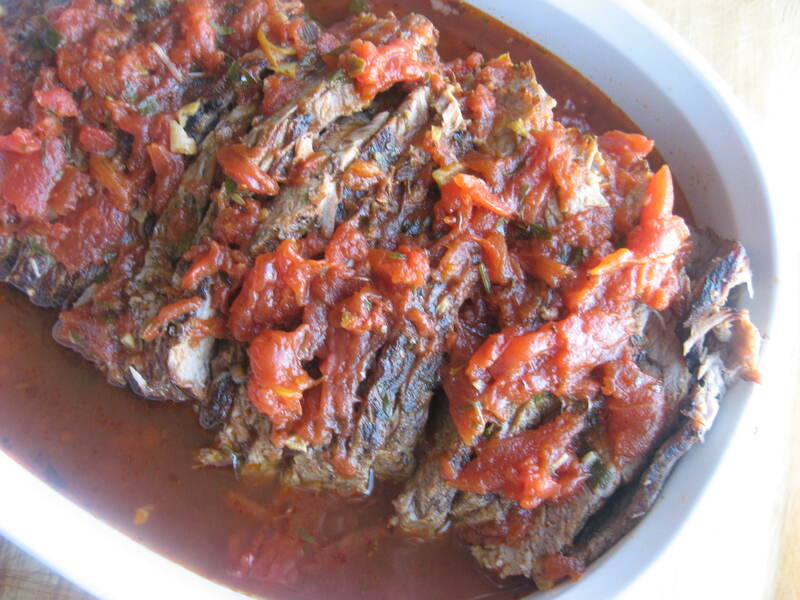 Here is the link to the recipe Sicilian-Style Pot Roast if you want to give this a try. I highly recommend it! and asparagus. It was a perfect Sunday dinner. Do you love soup as much as I do? I could eat soup three times a day, everyday for a month and never be sick of it. My husband has another opinion. He likes soup, but for him it’s a lunch item accompanied by a sandwich. For me, it’s a meal. For my children it means grilled cheese, because soup for dinner has to be shared with grilled cheese sandwiches or they won’t eat it. My family is fickle and they make me crazy sometimes. If you checked out my Smothered Roast Beef recipe from the other day, I hinted that the leftovers from that dish would be used in another recipe. This is that recipe. And before any of you balk at this I’m going to tell you upfront that some of the gravy from that roast beef is used as the base of this soup. Don’t go thinking that is weird, gravy in soup, because if you remember that gravy was made with a can of condensed cream of mushroom soup. So really, it’s only fitting for it to be in this soup. And it works. Very well, I might add. I make this in the slow cooker and it works out perfectly fine. 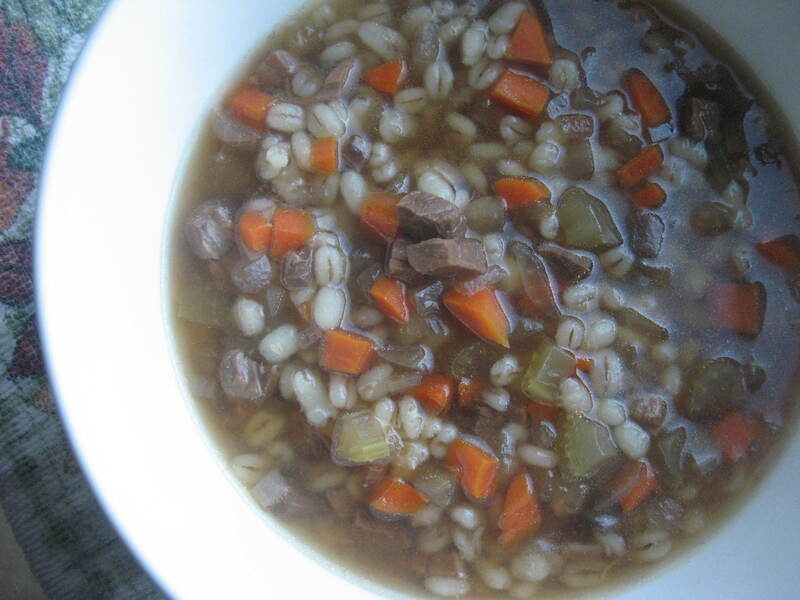 Place all ingredients in the slower cook leaving out the barley. Stir well, season accordingly, cover and set to low. Allow to cook on low for 4 hours. At the end of 4 hours, stir in the barley and cover. Allow to continue cooking for an additional 1 1/2 to 2 hours, or until barley is tender. Serve up with some grilled cheese.